Jonathan Pinnock goes through that “where did I come from?” moment that many of us get. Wondering about the family history, the origin of his last name etc. At the same time he is intrigued as to why there is a black reggae singer with the same surname and the fact that there are a lot of Pinnocks from Jamaica. 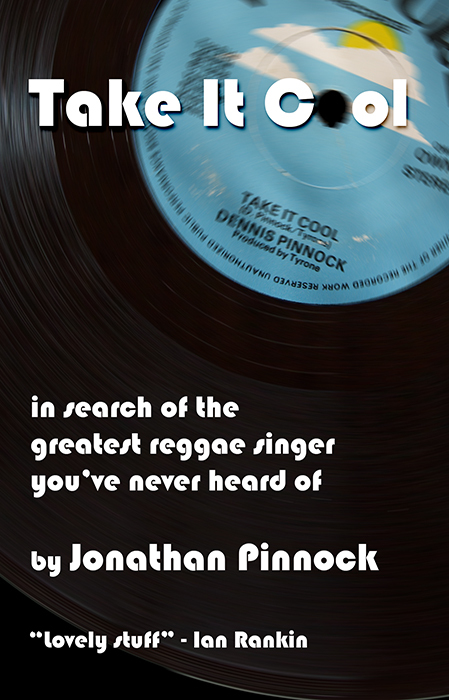 Being a fan, and becoming slightly obsessed with Dennis Pinnock, the reggae singer, Jonathan goes off in search of the history behind the name and attempts to meet with Dennis and interview him about his career. However how do you go about tracking down an obscure reggae singer anyway? Obviously Facebook will come into it, and email, but how do you get people you don’t know to speak to you about this sort of stuff? Pinnock writes with verve and humour and gently leads you through his somewhat odd quest, blending information about the records themselves (all singles), the musicians, the producers, the reggae scene and the history of the Pinnocks in Jamaica. The format of the book will be familiar to fans of Dave Gorman or Tony Hawkes perhaps but still feels fresh in Pinnock’s hands. There are plenty of footnotes, a discography and the descriptions of the singles were great. If anything, and this is a only very minor niggle, there was a bit too much information about the records in the main text which maybe could just have been put in the discography. For some people this may break the narrative perhaps. This is recommended for fans of UK reggae, music lovers, record collectors, family history aficionados and people interested in Jamaican history and the history of slavery. Overall – Entertaining and informative, well worth checking out.